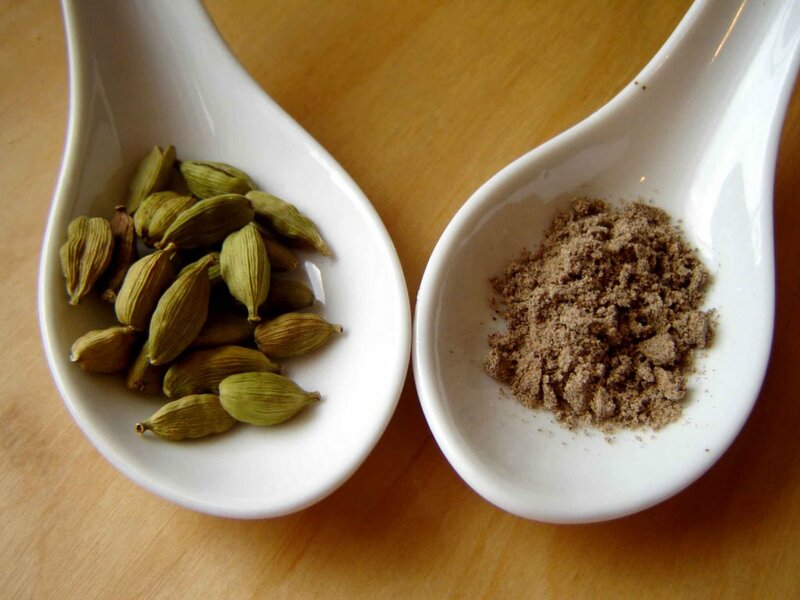 Cardamom is a bit more complicated than some spices. Its papery green or black pods are pretty but the good stuff, little black seeds, come hidden inside. Gathering enough of the seeds to grind and use in recipes is a bit of a chore, so I keep both the pods and the powder in the spice collection. Descriptions in Penzey's and The Spice House's catalogues are vague. Neither will pin cardamom down by comparing it with other herbs and spices. This is one of their standby techniques for describing products: caraway is related to cumin; paprika is a chile; anise, star anise, and fennel all taste somewhat alike. Waverly Root calls cardamom gingery, which seems wrong to me, but apparently the plants are related. I shall sniff one than the other and see if they have anything in common. One moment while I try. Yikes! Don't try that by sticking your nose into the dried ginger and inhaling hard--I just took in a noseful and now my nostrils are ruined for the cardamom. Cardamom is in its own universe. To me it smells sweet, floral, and citrusy (when my nose if functional of course), with less depth than cloves or cumin but more brightness. I think its scent is closest to coriander, which I also think of as bright and citrusy. Cardamom goes in everything from coffee cake to Cincinnati chili to South Asian curry. 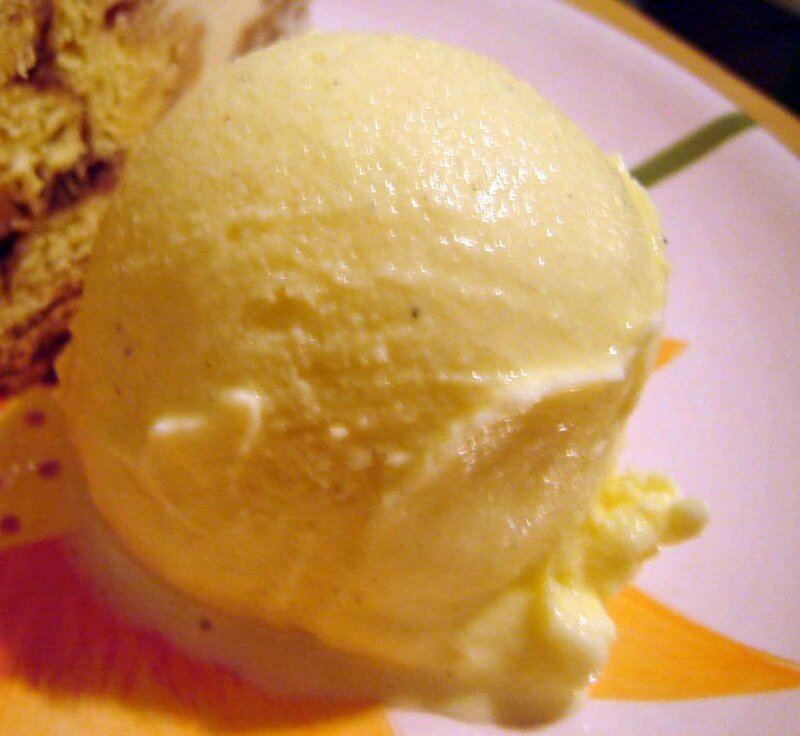 And it's surely the South Asians who first put it in ice cream, or kulfi as theirs is called. I began by steeping cardamom in cream. I used a generous quarter tablespoon of ground cardamom and four green pods, crushed to expose the seeds within. After warming these in 1.5 cups of half and half to just a simmer, I turned the heat off and left it alone forty-five minutes while we watched Veronica Mars. (Aaron Echolls, what a character. Nice to see him again.) I whisked vanilla sugar (4.5 oz) with four egg yolks, tempered, cooked, strained, added a cup of heavy cream. Chilled, churned, served (with some French cheese coffee cake from the gourmet market). It would be great atop the espresso brownies I'm going to bake one of these days. The flavor of cardamom is exotic but not at all strange. Since you can't get cardamom ice cream at very many American markets, this one is another good reason for making your own. My dining companions and I thought it was pretty great. Fab post. You *pin down* cardamom well. We at Naughty Curry have quoted and linked to you in our 'Random spice-Punx' sideblog. I'll have to order whole Cardamom via online store...can't find it here at local shops. Why is Cardamom so expensive? !